[279 Pages Report] The military radars market is projected to grow from USD 12.63 Billion in 2016 to USD 15.42 Billion by 2022, at a CAGR of 3.38% from 2017 to 2022. The objectives of this study are to analyze the military radars market, along with the statistics from 2017 to 2022, as well as to define, describe, and forecast the market based on dimension, range, platform, product type, component, frequency band, end user, application, and region. The year 2016 has been considered as the base year while 2017 to 2022 has been considered as the forecast period for this study on the military radars market. The ecosystem of the military radars market includes manufacturers of military radars such as Saab (Sweden), Israel Aerospace Industries (Israel), Raytheon (US), Northrop Grumman (US), Thales (France), Hensoldt (Germany), Lockheed Martin (US), Terma (Denmark), and BAE Systems (UK), among others. 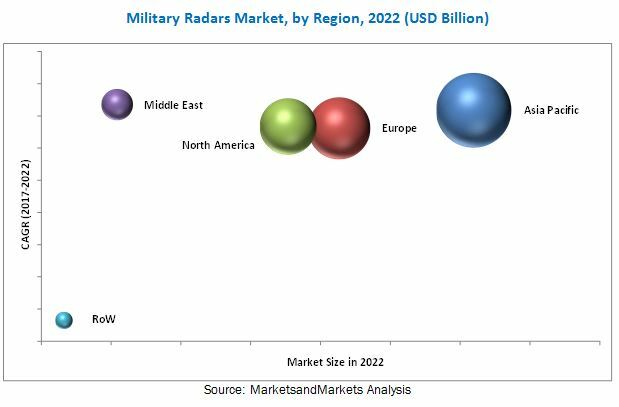 The military radars market is projected to grow from USD 13.06 Billion in 2017 to USD 15.42 Billion by 2022, at a CAGR of 3.38% from 2017 to 2022. Increasing defense expenditure for the development of air and missile defense systems, growing transnational disputes, and instabilities across the globe are major factors fueling the demand for military radars. 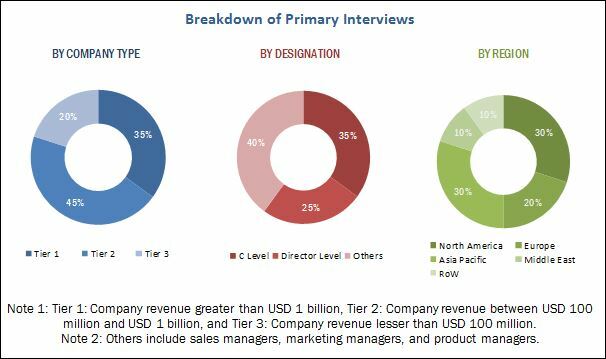 The military radars market has been segmented based on platform, frequency band, range, product type, dimension, component, application, end user, and region. Based on platform, the military radars market has been segmented into land, airborne, and naval. The naval platform segment is estimated to account for the largest market share in 2017. The increasing use of various air defense systems, multi-function radars, and fire control radars is expected to drive the growth of the military radars market in naval platform during the forecast period. Based on frequency band, the market has been segmented into VHF/UHF, L, S, C, X, and Ku/Ka/K bands. The X-band segment is estimated to account for the largest market share in 2017. The increasing use of various fire control radars and synthetic aperture radars in airborne, land, and naval systems has led to the growth in demand for radars working in the X-band frequency. Various ground surveillance radars operate in the X-band frequency for intruder detection. Based on range, the long range segment is expected to lead the military radars market during the forecast period. The growing threat of attacks from intercontinental ballistic missiles across the globe is fueling the demand for long-range military radars. Based on product type, the surveillance & airborne early warning segment is estimated to account for the largest market share during the forecast period. The increasing use of surveillance radars in air defense systems on land and naval platforms is leading to the growth in demand for these radars. Based on dimension, the 3D segment is expected to account for the largest market share during the forecast period. 3D radars provide better detection capabilities as compared to the 2-dimension technology. However, the 4D segment is projected to grow at the highest CAGR during the forecast period. Based on component, the digital signal processor segment is estimated to account for the largest share of the military radars market in 2017. Other component segments include antenna, transmitter, duplexer, receiver, display, and stabilization system. Based on application, the market has been segmented into airspace monitoring & traffic management, air & missile defense, weapon guidance, ground surveillance & intruder detection, airborne mapping, navigation, mine detection & underground mapping, ground force protection & counter battery, and weather monitoring. The air & missile defense segment is estimated to account for the largest market share in 2017 due to the increased use of air & missile defense radars in various land and naval-based anti-ballistic missile defense systems. Based on end user, the market has been segmented into army, navy, and air force. The navy segment is estimated to account for the largest market share in 2017. Large-scale modernization of ships, construction of new ships, and development of coastal surveillance networks are factors that have contributed to the growth of this segment. The military radars market has been studied for North America, Europe, Asia Pacific, the Middle East, and Rest of the World. The Asia Pacific region is estimated to lead the military radars market in 2017, while the Middle East military radars market is projected to grow at the highest CAGR during the forecast period. The growth of the Middle East market can be attributed to regional instability, long wars in the region, and non-conventional threats from terrorist groups, such as ISIS. Middle Eastern countries like Saudi Arabia, Israel, Qatar, and the UAE have increased their investments in military radars. The huge cost incurred in the development of advanced military radars is the major factor restraining the growth of the military radars market across the globe. Significant investments are required at different stages of the value chain of military radars (especially in the R&D, manufacturing, system integration, and assembling stages). The products offered by various companies operating in the military radars market have been listed in the report. The recent developments section of the report includes information on the strategies adopted by various companies to strengthen their position in the military radars market. Northrop Grumman (US), Raytheon (US), Saab (Sweden), Israel Aerospace Industries (Israel), Lockheed Martin (US), BAE Systems (UK), and Terma (Denmark) are some of the major players operating in the military radars market.